In 1892, Wilson Worsdell proposed to build twenty simple expansion express passenger 4-4-0s for the North Eastern Railway (NER). The NER Board amended the proposal and Wilson Worsdell produced the larger Class M1 (LNER D17/1) instead. The NER Board also requested the construction of a compound expansion version. This was probably because Wilson Worsdell's brother, T.W.Worsdell, favoured compound expansion and he continued to be employed as a consultant with the NER. The NER Board also continued to be interested in compound expansion due its extended use in other European countries. The "compound Class M1" No. 1619 was built at Gateshead in 1893 and given the classification of Class M. It used the Worsdell-von Borries system of compound expansion that T.W.Worsdell had used on his previous compound NER locomotives, but Stephenson valve gear was used instead of T.W.Worsdell's favoured Joy valve gear. Although No. 1619 was reported to have a 10% saving in coal over the simple expansion D17/1s, Wilson Worsdell had already decided on simple expansion for all of his future locomotive designs. The NER found that on many of its other locomotives, coal savings from the use of compound expansion tended to be overstated in controlled trials compared to normal operation. Hence No. 1619 would become the only example of Class M1, and it became a test locomotive for many of William Smith's ideas on improving locomotive efficiency. In August 1898, No. 1619 was re-built with Smith's patented three cylinder compound expansion system. This had one central high pressure cylinder and two low pressure outside cylinders. Piston valves were used instead of slide valves, and a slightly larger boiler was fitted. The NER developed this compound system further on the C8 4-4-2s. 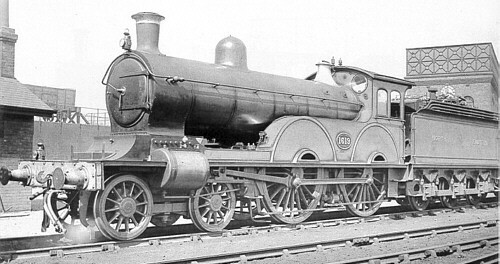 With Smith's death, the NER stopped developing his compound system but it would be later used on the Great Central Railway's (GCR) Atlantics (LNER Class C5) and on the Midland Railway's larger 4-4-0s. In 1914, No. 1619 was reclassified from Class M to Class 3CC. The LNER gave it the classification of D19. No. 1619 was initially allocated to Gateshead to work the East Coast express passenger services. A few years after it was rebuilt as a three cylinder compound, it was moved to Leeds. Whilst at Leeds, it was usually used on the Leeds to Newcastle, and Liverpool to Newcastle via Harrogate services. This was followed by a move to Hull Botanic Gardens in 1907, where it was used on the more important services that started at Hull. At this time, it was regularly used on the Bridlington line, and in 1926 it was permanently moved to the Bridlington shed. Whilst at Bridlington, No. 1619 continued to work the line to Hull, but it also worked services to Scarborough, Selby, and Leeds. No. 1619 remained at Bridlington until it was withdrawn in October 1930. HP and LP refer to High Pressure and Low Pressure, respectively. Heating Surface: Total: 1290 sq.ft. No. 1619 was withdrawn in October 1930 and was not preserved. I am not aware of any models of the D19 No. 1619 in any scale. Thank you Malcolm Peirson for the photograph of No. 1619.